You can almost feel the anticipation in the air—they knew what he’d been up to—as he sits down and begins to teach them. That’s where we pick up the story. Then he began to say to them, ‘Today this scripture has been fulfilled in your hearing.’ All spoke well of him and were amazed at the gracious words that came from his mouth. They said, ‘Is not this Joseph’s son?’ He said to them, ‘Doubtless you will quote to me this proverb, “Doctor, cure yourself!” And you will say, “Do here also in your home town the things that we have heard you did at Capernaum.” ’And he said, ‘Truly I tell you, no prophet is accepted in the prophet’s home town. But the truth is, there were many widows in Israel in the time of Elijah, when the heaven was shut up for three years and six months, and there was a severe famine over all the land; yet Elijah was sent to none of them except to a widow at Zarephath in Sidon. There were also many lepers in Israel in the time of the prophet Elisha, and none of them was cleansed except Naaman the Syrian.’ When they heard this, all in the synagogue were filled with rage. They got up, drove him out of the town, and led him to the brow of the hill on which their town was built, so that they might hurl him off the cliff. But he passed through the midst of them and went on his way. I’m not sure if almost getting thrown off a cliff is the mark of a good sermon or a bad one, but either way, in this moment, Jesus has managed to upset his entire hometown. This day started so well! Jesus has proclaimed the word of the Lord, and claimed those verses from Isaiah as his earthly mission. Even afterwards, the text tells us that everyone was amazed at his gracious words and teaching. But Jesus heads them off right there. He knows that they expect the same miracles he had done elsewhere—but not because they’re grasping for God’s grace. They expect miracles because, in their minds, they deserve them. After all, this is Joseph’s son. He’s one of their own. They expect him to stay there, to make a name for himself, and in the process, to make a name for them. They assume that the Lord’s favor will be theirs. The honor, the privilege, the standing associated with raising up a prophet will be theirs. Nazareth will be the center and main recipient of this good news, right? This is where the good news becomes bad news. Jesus isn’t there to establish a home base. He’s not even going to limit himself to just Israel. In time, the good news for the poor and relief for the oppressed and freedom for the captives will go out into all the world – Rome and Spain and Greece, throughout the Middle East and Africa, north and south and east and west. He reminds them, too, of all the prophets before him who were called to teach and preach and heal and care for those outside of Israel. The prophet Jonah was sent to Ninevah, the capital of Assyria. God sent Elijah to save the lives of a widow and her son in Sidon by miraculously stretching their food supply until the famine ended. Elisha opened his gate one day to an army general from the country of Aram, who only knew he existed because he had captured a little girl from Samaria, and healed him. God’s redeeming work has always been expanding. The blessing and love of God was always meant to flow out from God’s people, not stockpiled. God never seems to put much stock in national borders. So, Jesus isn’t in this to bring prestige to his hometown. He will proclaim freedom and healing and love to anyone who will hear him—and those who listen best, who understand the most, will be the people on the edges of acceptability. Ironically, it’s the people who know him best who refuse to hear him. They refuse to learn from these stories in their own Scriptures because they cannot yet fathom a God who does not favor them over others, but alongside others. The people of Nazareth are so angry at this idea that they attempt to hurl their newfound prophet off of a cliff. Jesus seems unfazed, and goes on his way. As we heard a couple weeks ago, each has its time and place—sometimes, saying hard truths will make someone angry, and you just have to deal with it. Other times, it’s up to you to say what you need to in a way that it can be received well. Unfortunately, that’s only something we learn with practice, and hopefully we learn it before we get to the cliff. But I think the question here is less about who’s angry, and more about how we receive the good news of God’s kingdom in our midst. Because the good news is almost always bad news first. We cannot rejoice in forgiveness if we have nothing to be forgiven for. We cannot lean in to God’s transforming work if we think everything is just fine the way it is. We cannot get well if we refuse to acknowledge we’re sick. We cannot be free if we don’t realize that something is holding us captive. Acknowledging this means acknowledging our own sin, our own dysfunction, our own illness, our own addictions and routines that hold us back. Martin Luther is the sort of founding father of the Reformed tradition – it was Luther who wrote and preached that God’s grace, freely given and never earned, ought to be the center of our life and faith. But he also believed and taught that every single one of us is sinful. We have all screwed up, we have all made mistakes, and we have all struggled. And he himself struggled with the weight of knowing exactly what his own sins and failings were, and sometimes struggled to rely completely on God’s forgiveness. He wrestled powerfully with that balance of knowing better and doing better, while also resting in God’s grace. This is one of the great gifts of our liturgy—each week, our prayer of confession acknowledges the reality of sin in our lives. It’s not exactly warm and fuzzy, but it’s true. 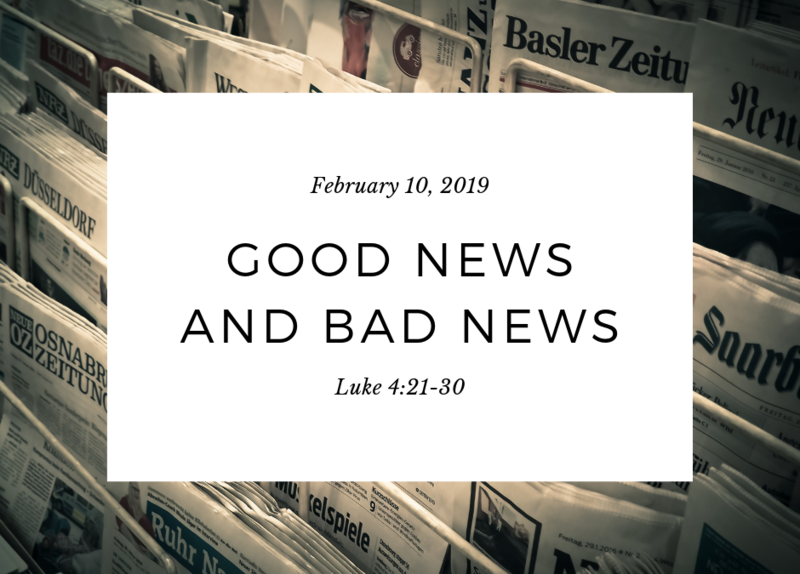 And every week, we work our way through the bad news that comes before the good news. This incident in Nazareth shows us what happens when we try to skip the hard stuff, or shove it down, or ignore it: that stuff, those questions, those failures, will eventually slip out and come at you sideways—and it will not be pretty. That’s what the church is for. We’re not gatekeepers, deciding who’s in and who’s out. We’re not in this for the fame, so that everyone knows who we are. We’re here because Jesus is here. We’re here because God is good, and worthy of praise. We’re here because the Holy Spirit draws us together to be Christ’s hands and feet in a world that so desperately needs to see God’s love at work. We’re here to become students of that love, joy, hope, and peace – for our own sake, yes, because goodness knows we need those things—but also for the sake of the gospel and the good of the whole world. The good news is that no matter how bad the bad news is, the good news will always have the last word. God’s love will always win out in the end. So, beloveds, no matter what comes your way, may the God of hope fill you with all joy and peace through the power of the Holy Spirit. Alleluia! Amen.